Domain Mondo's weekly internet domain news review (NR 2018-12-09 with analysis and opinion: Features • 1) Verisign $VRSN & New gTLD .WEB, Afilias vs ICANN, 2) ICANN news: a. EPDP Meetings & EPDP Initial Report, b. .INT and .ARPA, 3) Names, Domains & TMs: Verisign's Q3 2018 DNIB, 4) ICYMI Internet Domain News, 5) Most Read. ICANN Org IRP Status 11 Jan 2019 (pdf): "Panel Selection: IRP commenced on 26 November 2018; one panelist has been appointed; awaiting appointment of remaining two panelists ... No hearings are currently scheduled." Verisign Appendix of Evidence 1 to 27 . "... These designated authorities are trustees for the delegated [top-level] domain, and have a duty to serve the community. The designated manager is the trustee of the top-level domain for ... the global Internet community. Concerns about "rights" and "ownership" of domains are inappropriate. It is appropriate to be concerned about "responsibilities" and "service" to the community .... Significantly interested parties in the domain should agree that the designated manager is the appropriate party ... it is also appropriate for interested parties to have some voice in selecting the designated manager ..."--Jon Postel, March, 1994, RFC 1591. "[W]hen a decision is taken about a possible new top-level domain, ICANN's job is to work out, in a transparent and accountable manner, whether it is really in the best interest of the world as a whole, not just of those launching the new domain." --Sir Tim Berners-Lee at the Net Mundial Conference, April, 2014, in São Paulo, Brazil. Editor's note and analysis: the critical next step is the IRP emergency panelist's decision on Afilias's interim relief request (see below). If the request for interim relief is denied, ICANN could proceed to delegate .WEB and approve its transfer to Verisign within just a few weeks. Contrary to what has been reported elsewhere, the Afilias request is not a "slam dunk" and could be denied, in which case I would expect ICANN to move swiftly to delegate .WEB, and approve the transfer to Verisign. I understand Verisign is prepared to launch and aggressively market new gTLD .WEB worldwide (a/k/a "awareness campaign"), and I expect there to be some "premium pricing" which would only increase Verisign's margins (profits). There's a play here for domain investors, and for $VRSN investors, and .WEB might yet be the "top domain story of 2019." Once .WEB is delegated and launched, ICANN stands to gain immediate financial rewards in the form of .WEB registration and renewal fees, registry fees, and the net auction proceeds of USD $132,099,501.00 (ICANN has already appropriated for itself, inappropirately some say, a share of other new gTLD auction proceeds in order to replenish its "reserve fund" which was depleted in the course of the IANA Transition, including for payments totaling about $15 million for outside counsel legal fees). ICANN has apparently conducted its own analysis of the claims made by Afilias, and found them without merit. ICANN may also have been influenced by the U.S. Department of Justice Antitrust Division's closing of its investigation of Verisign and .WEB without action, as well as a similar factual situation in the private auction of new gTLD .BLOG to which no one objected, including Afilias. From the standpoint of domain name registrants as well as the entire global internet community, it would be better to have Verisign managing .WEB than Afilias. Verisign is a publicly traded company subject to close scrutiny by various regulatory agencies. Afilias is a privately-held entity with much less accountability and scrutiny. "... 16. .... 1. I estimated that the market value for .WEB at auction would be somewhere around USD 70-75 million. "2. It did not appear that many of the contention set applicants were willing to pay anything close to that amount at auction for .WEB. At that level, a losing applicant in a private auction would stand to earn more than USD 10 million on their USD 185,000 investment. Most applicants were willing to take that profit. This was, in part, driven by the marketing costs for .WEB, which were projected to be considerable. Given Afilias’ good relationships with leading registrars, we held a considerable advantage over the other members of the contention set, who would need to spend more than we would on marketing. "3. It appeared that our primary competition for .WEB would be from three other applicants: Web.com Group, Inc.; Ruby Glen, LLC; and DotWeb Inc.
"4. Because Afilias valued .WEB based on its long-term competitive prospects, our valuation was materially different from most of the other .WEB applicants. "For these reasons, we were confident that no other member of the .WEB contention set would outbid Afilias at auction." ". . . . 23 ... My contact at the private auction house told me that they had received signed applications for everyone except for NDC [Nu Dot Co LLC]. My contact further stated that they had tried to contact NDC about the outstanding agreement without success. "24. On 1 June 2016, I sent a text to Rasco about the outstanding agreement. Rasco replied that NDC’s Board had instructed him to not participate in the June private auction, but to proceed to the July ICANN auction. "... 25. Based on Afilias’ longstanding strategic goal to obtain .WEB to compete against VeriSign, Afilias was prepared to outbid all of the other applicants at the private auction. In preparation for the auction, Afilias had acquired sufficient financing to bid more than three times the record bid of an ICANN Auction at the time. "26. Given the incentives inherent in a private auction, as opposed to an ICANN Auction, NDC was potentially sacrificing millions of dollars by insisting on an ICANN Auction. Its decision to withdraw from the private auction therefore made little sense to me, especially as I considered it highly unlikely that NDC had a war chest of the size that would allow it to bid higher than what we could bid ..."
"21. ... VeriSign continues to dominate registrations of generic domain names. Consumers still flock to .COM, which continues to grow despite the introduction of new gTLDs and the increasing lack of attractive short .COM domain names. .NET, the second largest gTLD and also controlled by VeriSign, is only 11% of .COM' s size. Collectively, .COM and .NET account for more than 78% of all generic domain name registrations. "... 23. ... These facts have not changed over the years. VeriSign's .COM and .NET registries are the company's "cash cow," and it has been evident to the market and the Internet community for many years that VeriSign's strategy has been to aggressively protect its .COM and .NET business by selling off other business and going to great lengths to ensure that the renewals of its .COM and .NET registry agreements with ICANN are not in any way compromised." " ... 25. 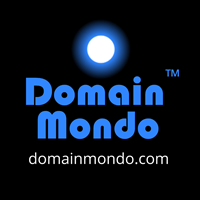 .WEB is largely considered to be the only new gTLD that can possibly compete with .COM .. WEB has the capability to compete with both .COM and .NET for new registrations, which will, over time, I believe, erode VeriSign' s market position. "26. VeriSign's current market position is largely the product of the network effects surrounding .COM. ..."
"... 39. In my view, NDC and VeriSign conspired to subvert the rules, policies, and principles that underlie ICANN's New gTLD Program .... 43. To-date, however, ICANN has done nothing to address these violations. Instead, ICANN is proceeding toward the delegation of . WEB to NDC-and therefore to VeriSign-as though none of this history and none of these events had ever taken place ...."
Background: New gTLD .WEB: Afilias vs ICANN, Verisign $VRSN & Nu Dot Co? Editor's final note: Privately held Afilias, is the world's second largest registry operator. Afilias was founded in October 2000, by a group of 19 major domain name registrars, with headquarters in Dublin, Ireland. According to IrishTimes.com, Afilias "was the first known company to relocate to the US on the back of 'favourable' tax changes introduced by US President Donald Trump last December ." Headquarters are now in Horsham, Pennsylvania, a suburb of Philadelphia. This IRP filed by Afilias could be just the first in a series of legal maneuvers, including the possibility of one or more private antitrust actions under U.S. law, which are not barred nor affected by the U.S. Department of Justice Antitrust Division' closing its investigation of Verisign and .WEB, without action as disclosed by Verisign in January, 2018. Afilias Domains No. 3 Limited, an Irish legal entity, could also resort to EU Competition law or authorities. The outcome of the hearing on January 14, 2019, could be interesting. See also: Cooperative Engagement And Independent Review Processses Status Update (pdf) 4 Dec 2018. EPDP meetings Tuesday Dec 11 and Thursday Dec 13 starting 14:00 UTC (9am EST). Observers use Adobe Connect, or audio cast (browser or app). Thursday Dec 13: Adobe Replay, MP3 (audio), Chat transcript (pdf). Notes and action items. Meeting transcript (pdf). Tuesday Dec 11: Adobe replay, MP3 (audio), and Chat transcript (pdf). Notes and action items. Meeting transcipt (pdf). Editor's note: I have not yet finished my comment to the EPDP Initial Report for reasons I will explain in next week's News Review. Anyone may submit their own comment by December 21, 2018. 3 Dec 2018: Letter from ICANN CEO Göran Marby to Ben Milam re: WHOIS Access & Enforcement Process marby-to-milam-03dec18-en.pdf (pdf). 06 Dec 2018 Letter from ICANN CEO Göran Marby to Helen Dixon and Willem Debeuckelaere (pdf) re: ICANN Contractual Compliance Data Processing Activities and GDPR (European Union's General Data Protection Regulation). 06 Dec 2018 Letter from ICANN GDD (Cyrus Namazi) to Registrar Stakeholder Group (Graeme Bunton) (pdf) re: ICANN Contractual Compliance and GDPR. ICANN IANA Services Customer Feedback Survey (pdf), excerpt above from p. 48 (of 57). Editor's note: .int and .arpa are two legacy top-level domains (TLDs) administered by ICANN and/or its affiliate PTI, (.arpa is technically "managed" by the Internet Architecture Board (IAB) (see RFC 3172) which is "a committee of the Internet Engineering Task Force (IETF) whose parent organization is the Internet Society (ISOC). It is way past time for ICANN and/or its affiliate PTI, to completely divest themselves from both TLDs .int and .arpa, both of which pre-date ICANN. IAB, IETF, or ISOC are more than capable of managing and administering the TLD .arpa. The ITU (itu.int) or other designate of the UN, or its Secretary-General, is more than capable of managing and administering the TLD .int which is reserved for use by intergovernmental organizations that meet the requirements found in RFC 1591. "In brief, the .int domain is used for registering organizations established by international treaties between or among national governments. Only one registration is allowed for each organization. There is no fee for registering an .int domain name."--iana.org. Similarly, ICANN should also be required to divest itself from management of the "L" root servers, which could be capably managed either by an affiliate (IETF, IAB, etc.) of the Internet Society (which is funded by .ORG operations), or the ITU or another affiliate of the UN (or UN Secretary-General). World's Ten Largest TLDs (total registrations worldwide) led by market dominant .COM (3 other gTLDs in the top ten: #5 .NET, #7 .ORG, and #10 .INFO. China has the largest ccTLD, .CN, which comes in at #2 in the top ten. Total country-code TLD (ccTLD) domain name registrations were approximately 149.7 million at the end of the second quarter of 2018, an increase of approximately 3.5 million domain name registrations, or 2.4%, compared to the first quarter of 2018. ccTLDs increased by approximately 5.5 million domain name registrations, or 3.8%, year over year, which is greater than the growth rate in gTLDs. Why? Editor's note: ICANN has terribly mismanaged gTLDs. .COM grew to 137.6 million domain name registrations (or 44% of all TLD registrations) from 135.6 million at the end of Q2 2018. .NET was flat at 14.1 million registrations at the end of Q3, the same as it was at the end of Q2 (Editor's note: .NET has been in annual decline since 2016, due to predatory fees and pricing imposed by ICANN and Verisign). 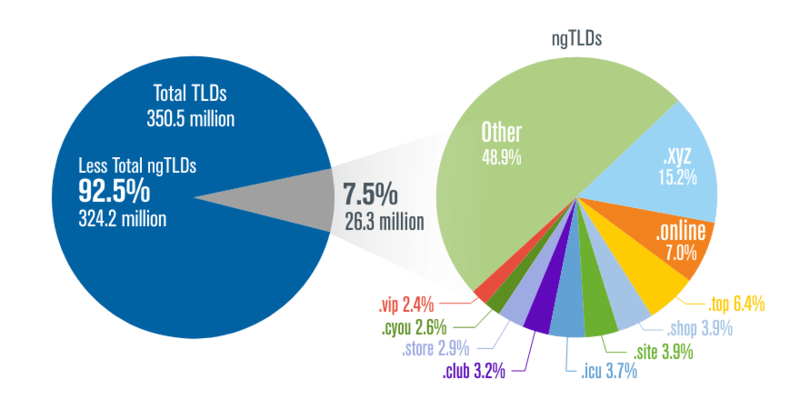 Total new gTLDs' domain name registrations are no longer in decline according to the report, but total only 23.4 million as of the end of the third quarter of 2018, or 6.8% of all domain name registrations. However, just 10 new gTLDs comprise over half of all new gTLDs' domain name registrations, indicating most new gTLDs are failing, badly. Editor's note: That's what happens when you flood the market with unwanted, unneeded TLDs which "fail to work as expected on the internet," and "break stuff", and are inherently plagued with ICANN's intentional design for unpredictable, predatory pricing in all new gTLDs. "Greed Is Good" is the real motto of ICANN (with apologies to Gordon Gekko). My advice: stay away from most of ICANN's new gTLDs, they are 'toxic' for registrants. a. Internet Users: Brazil has more internet users than Germany and the UK combined. The numbers: 149 million versus 79 million/63 million. Indonesia has 143 million internet users, more than twice those in France (60 million).--datatrekresearch.com. b. Building a More Resilient Internet--the U.S. Departments of Commerce and Homeland Security have developed a road map (pdf), that charts a path forward, setting out steps to stop the cyber threat to our internet infrastructure. It outlines a plan for coordination among government, civil society, technologists, academics, and industry sectors to develop a comprehensive strategy for fighting these threats. c. Australia first western country to pass a law forcing encryption backdoors--tomshardware.co.uk.